If I’m going to eat doughnuts, I’m gonna eat proper, fried doughnuts. Eff all that “baked not fried” crap, I want the real thing. Cruelty free, of course! 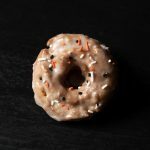 It was the Hubb’s birthday this past weekend, and I just could not get my mind off Pumpkin Spice Doughnuts. I searched and searched, and finally came up with a recipe that I knew I could translate into being vegan. Thank you Lindsey from American Heritage Cooking!! The first batch I did with silken tofu instead of the sour cream and eggs. They turned out a bit dry, so I decided to make another batch, and use vegan sour cream instead. Used a bit more pumpkin instead of egg yolks for the initial sugar & butter beating, and it worked beautifully. I used the beautiful coconut oil from my friends at CocoNana, but you could easily use canola oil instead. The result was a perfectly moist, not too dense, cakey doughnut with a slightly crispy texture that are what doughnut orgasms are made of. Seriously, you’re going to dream about these. Grab your favorite coffee mug, and a snugly blanket, and hole up on your couch with these! 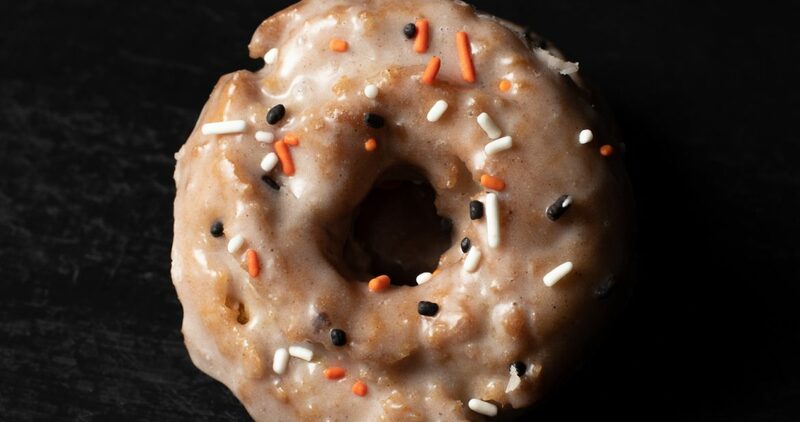 It’s fall in doughnut form. 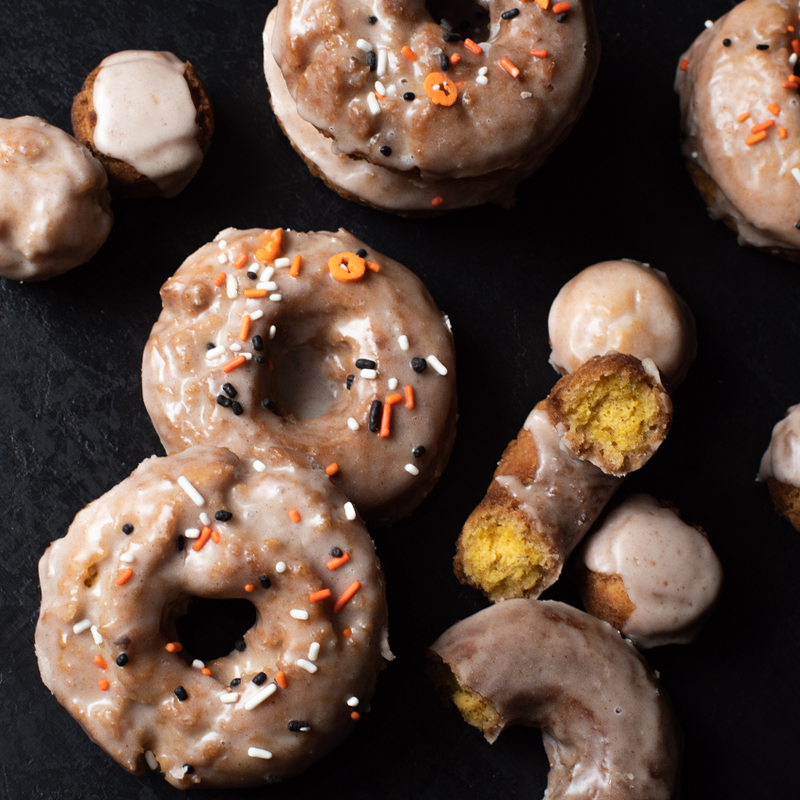 Light and pillowy with a slightly crispy exterior, these vegan pumpkin doughnuts will add even more cozy to your fall! Adapted from American Heritage Cooking. Oil For Frying. I used coconut oil, but you can also use canola. In a small sauce pan, add 1 cup of pumpkin puree, and keep over low heat to remove some of its moisture, about 20 minutes. Reserve to a bowl and place in the refrigerator until ready to use. In a large bowl whisk together the flour, baking powder, salt, cinnamon, nutmeg, ginger, cloves, and allspice. Add butter, sugar, and 2 tablespoons pumpkin puree to a stand mixer, and beat until light, fluffy, and pale about 2-4 minutes. Add the low-moisture pumpkin and sour cream, mixing until everything is fully incorporated, but not longer. Add the flour mixture in batches, making sure everything is incorporated before adding the next addition. I do this in about 4 additions. Line a large bowl with plastic wrap, and place the dough inside, folding the plastic wrap up and over the dough. Refrigerate for at least 30 minutes. In the mean time, make your glaze. In a medium bowl, add the glaze ingredients together. Whisk until no lumps remain. Set aside. Remove the dough from the refrigerator, and heavily flour the top of the dough while it's still in the bowl. Dust your countertop heavily with flour as well. Turn the dough out onto your countertop, so the floured surfaces meet. Flour the other side of the dough, and roll to a 1/2" thickness. Using a doughnut cutter, cut them out and place on a parchment or silpat lined baking sheet. Cover with plastic wrap, and place in the refrigerator for an hour. You can also use a 3 inch biscuit cutter to cut the doughnuts, and a 1 1/4 inch biscuit cutter for the doughnut hole. Over medium heat, place enough oil in a medium cast iron skillet to come up the side about 1 1/2 - 2 inches. Clip a candy thermometer to the side of the skillet. This step is essential, or your doughnuts will not turn out consistent. Heat the oil to 360°F. Working in batches, fry the doughnuts about 3-4 at a time. Fry the first side for about 30 seconds, flip with a slotted spoon, and cook for 60 seconds more. Flip again and cook for another 60 seconds, or until the doughnuts are puffed up and nicely golden brown. Transfer to a wire rack to cool. While you are frying, keep a very close eye on the oil temperature, so it stays between 340°F and 360°F. I adjusted the heat multiple times while frying. Keep in mind the oil temperature will dip once you place the cold doughnuts. It will gradually heat up as they fry, so keep all of those factors in mind. Once the doughnuts are all fried, whisk up the glaze to break up any skin that may have formed, then dip the doughnuts in the glaze. Place on a wire rack over top a cookie sheet or paper towels to avoid making a mess. 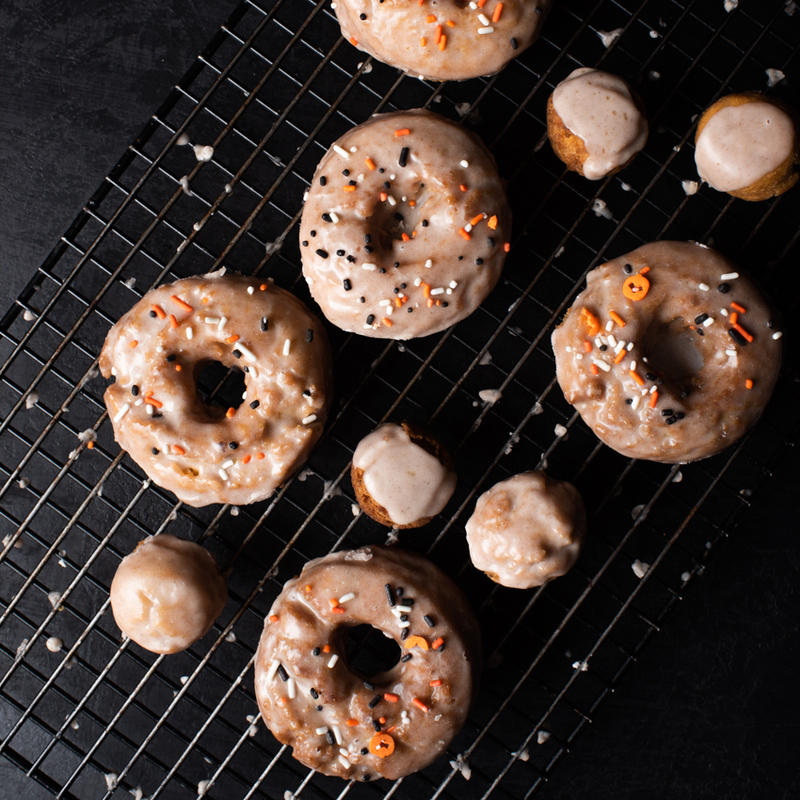 If decorating with sprinkles, sprinkle them on after glazing one or two doughnuts, as the glaze dries fast! Consume immediately! It’s a great feeling to have people (other than your husband) try the real thing! Haha Thanks Cathy, it was great seeing you. The pleasure was all mine Selena! Thank you for sharing all of your insight and expertise! Natalie – I took one of these home last week, warmed it up in the toaster oven and it totally rocked. Delicious!! !